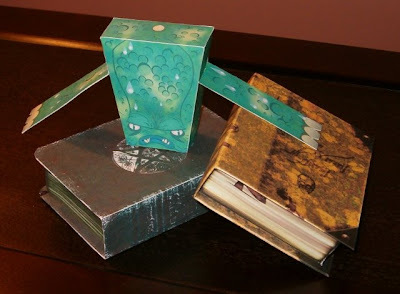 Here are three papertoys from the realm of Lovecraftian horror literature. Writer H. P. Lovecraft and his circle of authors created a shared fictional universe. In this universe there are various arcane books of forbidden lore which reveal secrets about ancient monstrous entities. The black book is a papertoy of Unaussprechlichen Kulten, a book first appearing in the works of Robert E. Howard. The yellow papertoy book is De Vermis Mysteriis first seen in the works of Robert Bloch. On top of the books is a papertoy of Cthulhu, one of the ancient entities often mentioned in Lovecraftian literature. Each of these toys was created by Jerom, France, 2007 and can be found here, here, and here. I have finished my second papercraft design! 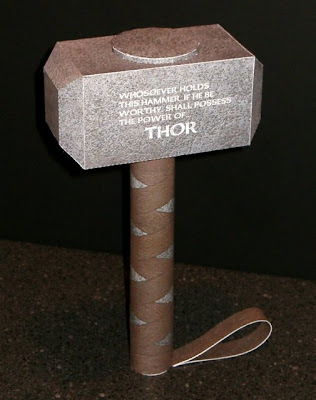 This model is of Mjolnir, the weapon of the Marvel Comics superhero Thor. The character of Thor was created by Stan Lee and Jack Kirby and is based loosely on the god of thunder of the same name from Norse mythology. Mjolnir, among other things, enables Thor to fly, summon lightning, and create interdimensional portals. Rumor has it that a Thor movie will be released in 2010. Let's hope it will be as good as Marvel's Ironman was in 2008. There are two things that always make me smile: monkeys and robots. So you can expect to see builds of both in the future. :) Today the post goes to robots. 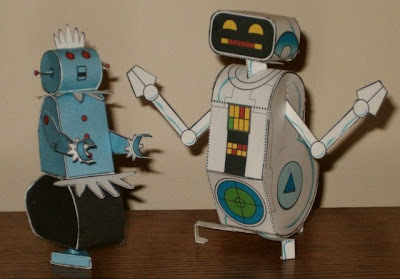 On the left is Rosie the robot maid from the early 60's American television cartoon The Jetsons . The model may look simple but it actually took some time to complete. The original template is very small, without instructions, and was not designed with any gluing tabs. I enlarged the template almost 100% and improvised my own gluing tabs to make it easier to build. The original template was designed by Phil Shore, USA, 2008 and can be found here. On the right is H.E.R.B.I.E (Humanoid Experimental Robot, B-type, Integrated Electronics) from the 1978 Saturday morning cartoon The Fantastic Four which was based on the Marvel comic book series of the same name. The H.E.R.B.I.E character was designed by none other than comic book legend Jack Kirby who was working as a story board artist for the show at the time. After the show was canceled, H.E.R.B.I.E eventually began making appearances in the FF comic books themselves. The template for this papercraft was designed by Sean Kleefeld, USA, 1998 as part of a "fun pack" which was offered on his Fantastic Four fan site.The original template (see below) was designed to be assembled without glue but I improvised some gluing tabs on the head and body to help the model hold its shape better. I have a fondness for movie prop papercraft. Many of the papercraft I am currently designing fall into this category. 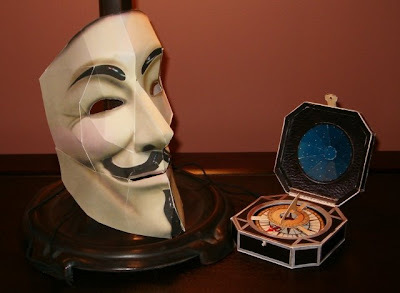 On the left is a Guy Fawkes mask from the 2005 movie V for Vendetta. The template for the mask was designed by Kim Ruben, Norway, 2006 and can be found here. On the right is Jack Sparrow's compass from the Disney Pirates of the Caribbean movies. The hinged lid latches and the compass pointer actually spins. The template for the compass is by Robert Nava, USA, 2006 and can be downloaded here. Both these models are at 1:1 scale. I am currently working on several papercraft designs and this is the first to be finished. It shouldn't be hard to see why this one was first. It only has three parts! 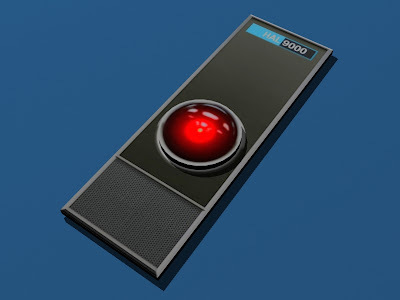 :) The "HAL 9000 Interface" was the electronic eye and speaker which the HAL 9000 computer used to communicate with the crew of the spacecraft Discovery One in the 1968 movie 2001: A Space Odyssey. My daughter wanted animals as decorations on her birthday cake. These are a few I built for the occasion. Each one is constructed out of 110 lb (200 gsm) cardstock, although using something less stiff might have been easier due to their curving construction. To keep their paper feet from getting ruined by the icing I designed a cake top platform for them to sit on. With some modifications I may post the platform later as a download. All the animals pictured were designed by Tetsuya Watabe, Japan, 2007-2008 and can be found here. 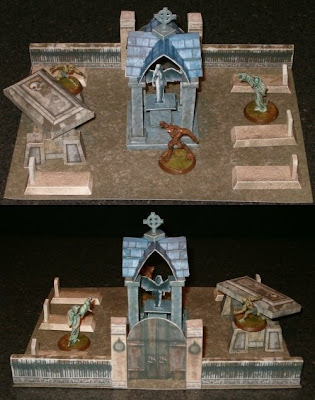 Wall, gate, and graves by Wizards of the Coast, USA, 2003. Mausoleum and ground texture by Oidessy Paper Models, Italy, 2003. Tomb by Stones Edges, USA, 2004. Model can be found here. The hardest part of each of these models was getting the final side taped in place without crushing the model. 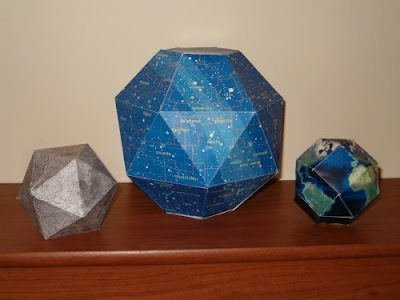 I was first introduced to the hobby of papercraft in the summer of 2008. Inspired by what I saw, I started building free models from the internet and also designing my own models. 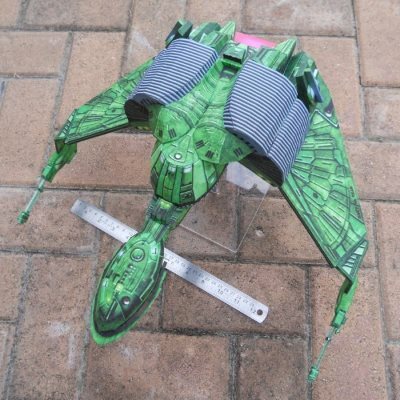 My purposes for creating this blog are: 1) to share my builds and offer information on where the models can be found and 2) to post for others the free designs I have created. With any luck I should be able to post my first free model no later than January 2009!